Today's post is a bit of an unconventional one in that I'll be talking about how to use certain products rather than reviewing the actual products themselves. I want this blog to be user-friendly for people with all different levels of expertise in makeup, so if you enjoy this post please be sure to let me know! In this mini-series, I'll be exploring the world of makeup brushes which can be quite tricky to navigate as a makeup novice. Makeup brushes are critical to makeup application so it's important to know which brush should be used when. Today's post will be all about which eye makeup brushes you should use to make sure your eyeshadow/liner/mascara is looking flawless. Without further ado, lets dive in! In the photo above, we have (from left to right) a precision eyeliner brush, an eyeshadow crease brush, and a flat eyeliner brush. Precision eyeliner brush: Any brush that is super tiny, thin, and slightly pointed like the one you see up top is best suited for applying gel and liquid eyeliners. It allows for precise application of your liner to get it to the exact shape and style that you desire. This is also a great brush to use for tightlining your eyelids as it will allow you to fit your liner snug beneath and between your lashes. Eyeshadow crease brush: This is my my personal brush style of choice for applying eyeshadow in my crease. The round shape of the bristles allows you to fully cover the area underneath your brow bone. 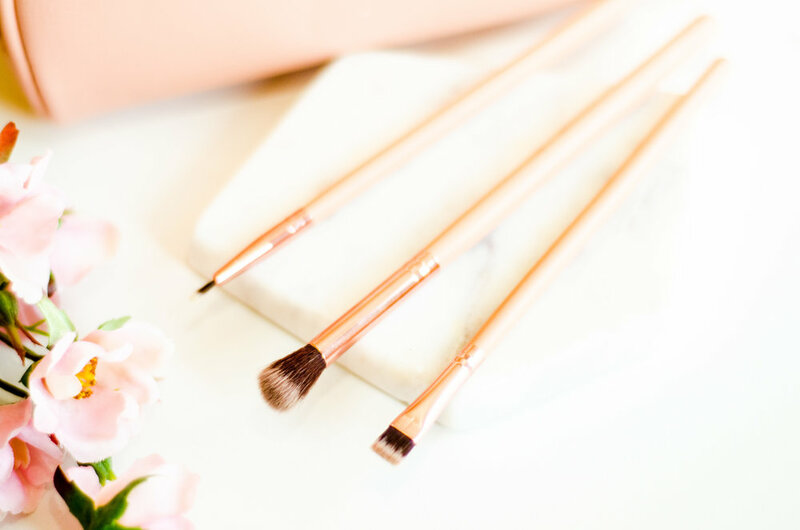 I prefer super fluffy and dense brushes like the one you see above to ensure that you can evenly disperse your eyeshadow and blend it with ease. Flat eyeliner brush: Although this brush would definitely work with cream and gel eyeliner, I prefer to use it when I'm applying eyeshadow to my lower lash line, as the square shape of the bristles is rigid enough to smoke out the shadows you're applying in that area. I've also heard of people using this brush style to highlight underneath their brow bone, tightline, or clean up their eyebrows or lipstick with concealer. It's super versatile! In the photo above, we have (from left to right) a eyebrow brush/metal eyelash comb duo, an oval eyeshadow brush, an eyeshadow blending brush, and an angled eyeliner brush. Eyebrow brush/metal eyelash comb: This is the brush that transformed my makeup routine. Although it appears so simple, the metal eyelash comb is completely revolutionary. Eyelash combs made of plastic would always fall apart on me and would never separate my lashes adequately, whereas a metal eyelash comb lifts and separates my lashes and allows me to avoid the dreaded spider leg mascara effect. An eyebrow brush made of stiff bristles is also super useful for taming stray brow hairs and structuring your desired eyebrow shape. Oval eyeshadow brush: This style of brush is optimal for applying eyeshadow to your eyelid. The curvature at the top of the bristles is perfect for easily sweeping shadow across your lids while avoiding your crease. I personally own a bunch of these in all different sizes to use depending on the style of eyeshadow I'm going for that day. If you only own this brush along with a crease brush, that would be sufficient for doing your eyeshadow gorgeously! Eyeshadow blending brush: This style of brush is used to blend different colors of shadows together and soften up harsh lines. Although this looks similar to the crease brush, the blending brush is actually a lot less dense than the crease brush. I personally like my bristles to be super soft and flexible in a blending brush so that I can use small circular motions to easily blend out my shadow. Angled liner brush: This is another style of brush that can be used for cream or gel eyeliner to get those ever-sought-after crisp lines. It is great to use when applying winged liner, as the shape of the brush fits the flow of a wing pretty well. However, I get the most use out of these brushes by using them to apply product to my eyebrows. It allows me to get the tails of my brows to look super sharp. I use quick, small strokes with this brush in my brows to simulate brow hairs and make them look more natural. From L-R: Coastal Scents Detail Shadow Brush, Crown Brush C47 Crease/Shadow Brush, Coastal Scents Dome Blender Brush. Coastal Scents brushes are from the 22 Piece Brush Set. In the photo above, we have (from left to right) a small detail eyeshadow brush, a pencil brush, and a small crease brush. Detail eyeshadow brush: This is a brush in the same shape as the oval eyeshadow brush, but less dense and much smaller. This is another super versatile brush that I use for lots of things. As far as eyeshadow goes, I like to use this to apply eyeshadow to my inner corner. I also like use it to apply concealer to clean up goofs in my eyeliner or lipstick. Finally, I like to use this to apply liquid or cream lipsticks if I'm just not feelin' their traditional doefoot applicators. Pencil brush: The brush in the picture above is a double-ended brush, but the side I wanted to focus on is the pencil brush side. As you can see, the bristles are fat at the bottom and come to a sharp point, much like a pencil does. As you may suspect, this shape makes it perfect to "draw" shadow onto your lower lash line and smoke it out, or smudge out pencil eyeliner. Small crease brush: This brush is similar in shape to the crease brush I mentioned earlier, but this one is much smaller. However, it is just as dense! For that reason I love to use this to concentrate eyeshadow in my outer corner or outer v of my eye. It still deposits product and blends super well just as the crease brush does, but its small size makes it more ideal for deepening up your eyeshadow in that snug outer corner of your eye. There's my lo-down on the basic types of eye brushes! Of course there are many more shapes and sizes of eye brushes, I just wanted to outline the main players in my collection. I apologize for the length of this post, but please let me know if you found this review helpful. Be on the lookout for part 2: face brushes edition coming soon!